Bill Wolpin is the Associate Publisher and Editorial Director of American City & County,Government, Product News and Government Procurement magazines. Bill has judged several national magazine and engineering award competitions, and has been a speaker at the magazine industry’s leading conference as well as several solid waste and government association events. His magazines have won more than 80 national, regional and state awards for excellence, including a 2001 Jesse H. Neal Award for his editorials in Waste Age, four Folio Gold Editorial Excellence Awards and a Gold Ozzie. He also was a 2005 Neal Award finalist for his editorials inAmerican City & County. Bill has received an employee excellence award, a CEO Award and was a finalist for employee of the year. In 2003, he was the recipient of the Lawrence Lecture award, the highest honor bestowed by the Solid Waste Association of North America. 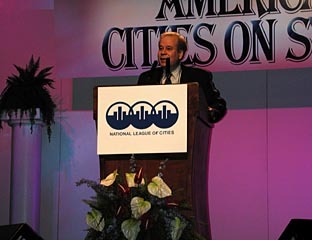 In 2006 Magazine Association of the Southeast, where he served as president and member of the executive board, selected him for its Hall of Fame. Placing very talented young editors in positions they can grow professionally. a story about landfills accepting treated wood, which is preserved with arsenic. There are more, but those come quickly to mind. Local. Those folks live in the community and if nothing else, are physically close enough to the people they represent or serve to see the effects of their work and hear directly from them. Don’t own one but enjoy listening to exceptional pieces of music in all genres, from rock and country to classical. Like my appreciation for athletes, I admire the best at what they do. From A to D+ (assuming they are trying at all). Sorry, I don’t read books much since I read and write for a living. I am part of the short attention span nation, reading magazines, newspapers and short stories. What’s it like being in the Hall of Fame? Does the Magazine Association of the Southeast rival Cooperstown or Canton? While I am too physically lazy to play sports, I seriously like watching exceptional athletes no matter the competition, baseball, boxing, gymnastics, even ping pong. I was lucky enough to be chosen by the government association for solid waste executives — the Solid Waste Association of North America’s top honor, the Lawrence Lecture Award. To sweeten the prize, I was nominated by the editor of a competitive magazine. The Magazine Association of the Southeast Hall of Fame award was given to recognize about 15 years of serving in many of those thankless positions of any association, including the presidency. You owe some of your time and energy to the professional community you live in and to young people coming into the profession. Ever consider running for elected office? Like wanting to be Superman when I was 5, I wanted to be president by the time I was 10. By the time I was 16, I just wanted a girlfriend and a hot car, so things change. I naturally empathize with people, even those with bad qualities, because I have them, too. We have a lot of politicians, but very few statesmen. Still, I’ve thought about running for public office from time to time, knowing that it wouldn’t be much fun but potentially rewarding, especially at the local level. I’m not sure I’m ready to write that headline but let me tell you my favorite, in this case a real one for a deceased physician’s obit: Urologist Mourned by his Peers. That’s a tough one to top. Editor’s Viewpoint: Can you manage your management job?